Stock photo of an Eagle and Sea lion Moon Mask by Trevor Hunt, Kwagiulth First Nation Artist, original West Coast native art, Just Art Gallery, Port McNeill, Northern Vancouver Island, Vancouver Island, British Columbia, Canada. 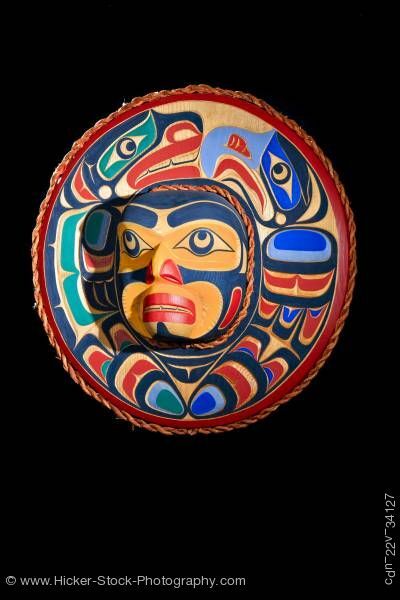 Eagle and Sea lion Moon Mask by Trevor Hunt, Kwagiulth First Nation Artist, original West Coast native art, Just Art Gallery, Port McNeill, Northern Vancouver Island, Vancouver Island, British Columbia, Canada. Trevor Hunt is part of the great Hunt Family of Fort Rupert on Vancouver Island in British Columbia, Canada. He comes from a long line of hereditary carvers and artists that have been instrumental in the survival of the Kwaguilth art form on the northwest coast. His father is Stan Hunt, his Grandfather was Henry Hunt and his great-grandfather was Mungo Martin. He has been painting original graphic interpretations of Kwaguilth myths and stories since he was 10 years old and in 1997 began carving in wood under the tutelage of his father, Stan Hunt and his brother Jason Hunt. His teachers include Tim Alfred and David Knox. He has recently completed a 38-foot painting of a Killerwhale on the roof of a resort in Telegraph, B.C. and designed the logo for the Thunderbird Shopping Plaza in Port Hardy, B.C.